I have already posted about one of the awesome gifts I received for Christmas. I received another one that makes me so happy when I use them I just wanted to share. You might remember I bought a speaker for my iPhone awhile back. 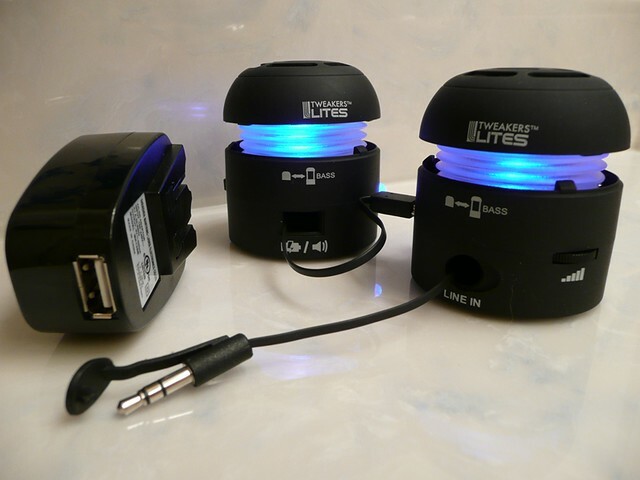 I was so impressed with it I wanted to share about it because it is great to have a portable audio source, just in case. It is really helpful when you are teaching a dance exercise class like Nia. Well, more like it came up on Woot. My hubby looks at Woot and he knows how much I love my other speaker so he asked me if I wanted what they were selling on Woot. I glanced at it and said yes because it was LESS than I paid for my other speaker AND it was TWO speakers! They are REALLY cool. When my hubby showed me I hadn’t even read all the cool features! First of all as I said, they cost less than my ONE speaker I originally bought. They are black but when they are in use and they are open they glow blue! These little guys are so cool. They have their own bag, I love things that have their own storage. They fit together and stick with magnets. They have a volume control. They have an audio in cord and a connection cord. One speaker has the audio in cord. The other speaker has the cord that connects them. So you can just use one if you want. BOTH cords retract back into their respective speakers. How cool is that? I had just been telling someone over Christmas that I think every electronic device that has a cord (whether optional or not) should have a place that the cord can be stored ON/IN the device. But that is just me because I have what seems like a million cords and I don’t know all the devices they belong to. So every time I put these speakers away I am so impressed because I just pull gently and the cord goes right in. They are great sound for such little devices. This particular pair came with a “BONUS! USB wall adapter” which the package claims is usually an extra $19.95. The speakers on Woot didn’t even cost that much AND it came with the additional adapter. I loved them so much I looked online to see if we could get more. We can, but at more than twice the cost and without the “BONUS”. I don’t NEED them so I’m not going to spend it. I just really like them and since the places I teach Nia at for the city of San Jose do not always have sound systems I was thinking I could keep a pair in my car. The iHome/first speaker I bought does not have an electrical adapter. It only charges off a USB. So when I use it at a venue I am teaching at I have to make certain it is charged. But these speakers I just got, I could leave in the car and not have to worry about them being charged because in a pinch I could plug them in and use them. Also the iHome speaker does not have a volume control. Which is fine, because the device it is used with does. But I found out that it is really cool to have two options of volume control! 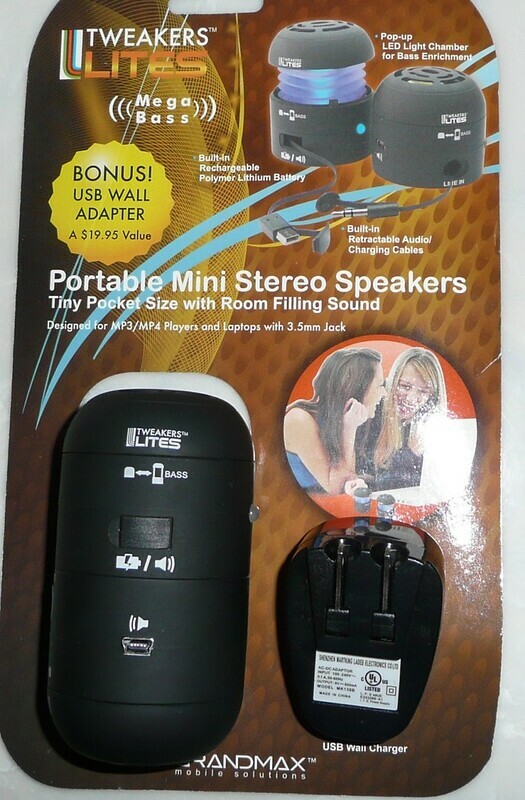 Of course these speakers would work with iPhones, iPads, iPods, MP3 players, MP4 players, and laptops! Yeah, no post about goals and resolutions, just an excited post about something that makes me happy. I hope you enjoyed your New Year’s Eve. I wish for you to enjoy 2013.